Astro produces components and assemblies for the medical equipment industry. In our history we have been contracted to build health monitoring systems, complete patient support couches, medical simulator systems used for training, refurbished equipment, OEM and service parts and assemblies for many different systems or products. Astro is a leader in the production of aerospace and military components for some of the largest companies in the United States. For decades Astro has produced military and commercial aircraft components, helicopter components, aircraft wheel and brake components, missile components, torpedo components and sub-systems, flight simulator enclosures and even parts custom designed for International Space Station (ISS) applications. 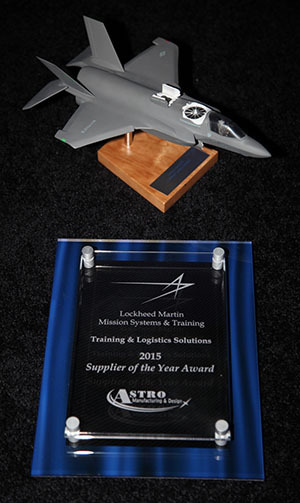 Aerospace manufacturing is a major part of Astro Manufacturing & Design’s core competencies and we are an ITAR Registered facility. Astro produces parts, subassemblies, or complete processing machines, used in the manufacturing, processing, packaging, or inspection of a wide variety of commercial products. Many of our customers fall into the category of general industrial manufacturing, for which we produce parts, sub-assemblies or automation systems. Our systems have allowed our customers to improve their efficiency in production, inspection, or testing. Industries served include food processing, cosmetics, electronics, energy, vehicle components, and many other applications.